Welcome back. Having worked in science and engineering (S&E) for over half a century, I find it difficult to accept that I now have to march to defend science. Nevertheless, I did, as I blogged in Marching for Science. But this blog post isn’t about me or marching; it’s about a report: The National Science Foundation’s Science & Engineering Indicators 2018. The NSF is the federal agency that supports fundamental research and education in non-medical S&E. Its governing National Science Board is congressionally mandated to report the status of U.S. S&E every two years. Chapters of NSF Science & Engineering Indicators 2018 report. Although the report is based mainly on data collected through 2015 or 2016, it offers unique and useful background for assessing where we are and where we’re headed. The online, interactive report is loaded with clearly presented, wide-ranging data and commentary. Included for separate, easy access with the full report are a digest; the data; the figures; trends in S&E by state; sources of U.S. research and development (R&D) expenditures; as well as a further breakdown of other report content. The digest is particularly useful, serving in effect as an executive summary that introduces the report, highlights important trends and links to the available data. 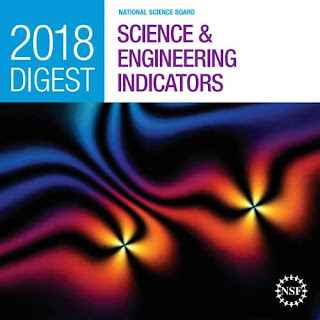 It focuses on 42 indicators under 7 themes, 3 of which are viewed globally--R&D spending; research outputs; and science, technology, engineering and math (STEM) education--and 4 of which are viewed domestically--R&D funding and performance; the S&E workforce; invention, knowledge transfer and innovation; and public attitudes and understanding of science and technology. The big news is that, while the U.S. holds a preeminent global position in S&E, the lead is shrinking. Other nations, especially China, increasingly recognize scientific and technical capabilities as engines of economic growth. 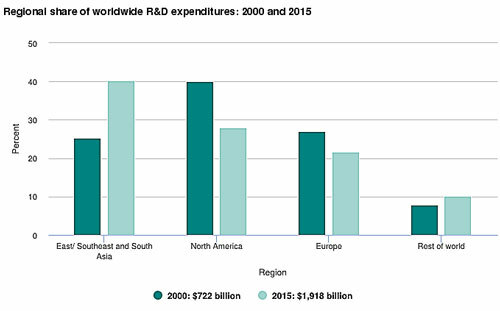 Between 2000 and 2015, China, India and South Korea expanded R&D expenditures rapidly compared to the pace of the U.S and European Union (E.U.). In 2015, the U.S. accounted for 26% of global R&D expenditures; China accounted for 21% of the total. Percentage of Global R&D expenditures by region in 2000 and 2015 (from NSF Science & Engineering Indicators 2018). R&D improves production processes in manufacturing and services, a major component of the global economy. China has grown to become the largest global producer in medium-high-technology manufacturing industries and second only to the U.S. in high-technology manufacturing industries. Research publications contribute to knowledge. In 2016, China produced the largest number of articles in engineering, chemistry, physics, geosciences, computer sciences and agricultural sciences. Over the past 15 years, nearly half of the S&E bachelor’s degrees awarded globally were conferred in India (25%) and China (22%), compared to 10% in the U.S. Permit me to select data on a few areas that are seeing significant change under the current administration--defense, sustainable energy and immigration. Defense’s share of the federal R&D budget was anomalously low in 2009 (52%), but since 2010 it has gradually declined (58% to 53%). Expect that to zoom ahead. The large investment and deployment of sustainable energy technologies grew renewable energy generation capacity from 130 gigawatts (GW) in 2006 to 912 GW in 2016, excluding hydropower. Between 2010 and 2016, China added a cumulative 200 GW of solar and wind generation capacity, the E.U. added a cumulative 137 GW and the U.S. added much less, 82 GW. It’s likely the U.S. will continue to lag. Foreign-born scientists and engineers are critical to the U.S. S&E workforce--41% of master’s degree holders, 36% of PhDs and over half of PhDs in engineering, computer sciences and mathematics occupations are foreign born. The squeeze on immigration is having an effect. The number of international students in the U.S., which was climbing steadily, dropped in 2017 in nearly all areas. The largest graduate student declines were in computer science and engineering. I’ve been living in Wisconsin for the past few years, though my ties are stronger to New York and Virginia. As an example of the state-specific data available in the report and the way it can be manipulated, I compared the percentage of bachelor’s degree holders among individuals 25-44 years old in the U.S. and each state. 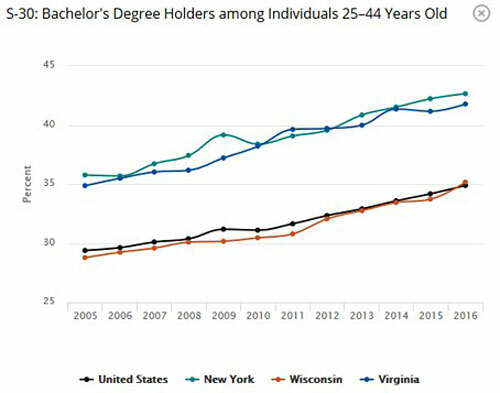 Percentage of bachelor’s degree holders among individuals 25-44 years old in U.S., New York, Virginia and Wisconsin, 2005-2016 (derived from data in NSF Science & Engineering Indicators 2018). I strongly recommend you take a look at the report. I’m sure you’ll come up with something much more significant. Thanks for stopping by.